Yu Zheng, Licia Capra, Ouri Wolfson, Hai Yang. Urban Computing: concepts, methodologies, and applications. ACM Transaction on Intelligent Systems and Technology (ACM TIST). 2014. Urban computing is also a research project in Microsoft Research, led by Dr. Yu Zheng since March 2008. By analyzing the big data generated in urban spaces, a series of urban computing applications have been enabled as follows. One of core research problems is to fuse data across different domains. The other is to learn knowledge from spatio-temporal data, e.g. trajectories. 2017.4.9: We are organizing the 6th International Workshop on Urban Computing (UrbComp 2017) in conjunction with KDD 2017. 2017.4.9: A tutorial on Cross-domain Data Fusion. Download slide decks for free! Refer to Urban Air’s homepage for more details. Public Website: http://urbanair.msra.cn/ Install Windows phone App here. Goal: We infer the real-time and fine-grained air quality information throughout a city, based on the (historical and real-time) air quality data reported by existing monitor stations and a variety of data sources we observed in the city, such as meteorology, traffic flow, human mobility, structure of road networks, and point of interests (POIs). Methodology: We propose a semi-supervised learning approach based on a co-training framework that consists of two separated classifiers. One is a spatial classifier based on an artificial neural network (ANN), which takes spatially-related features (e.g., the density of POIs and length of highways) as input to model the spatial correlation between air qualities of different locations. The other is a temporal classifier based on a linear-chain conditional random field (CRF), involving temporally-related features (e.g., traffic and meteorology) to model the temporal dependency of air quality in a location. Yu Zheng, Furui Liu, Hsun-Ping Hsie. U-Air: When Urban Air Quality Inference Meets Big Data. 19th SIGKDD conference on Knowledge Discovery and Data Mining (KDD 2013). Goal: We forecast the reading of an air quality monitoring station in the next 48 hours, using a data-driven method that considers the current meteorological data, weather forecasts, and the air quality data of the station and that of other stations within a few hundred kilometers to the station. Methodology: Our predictive model is comprised of four major components: 1) a linear regression-based temporal predictor to model the local factor of air quality, 2) a neural network-based spatial predictor modeling the global factors, 3) a dynamic aggregator combining the predictions of the spatial and temporal predictors according to the meteorological data, and 4) an inflection predictor to capture the sudden changes of air quality. The research identifies the spatio-temporal causality between air pollutants of different cities, suggesting the root cause of air pollution based on AI and big data technology. Refer to the homepage of CityNoise for details. Goal: we infer the fine-grained noise situation (consisting of a noise pollution indicator and the composition of noises) of different times of day for each region of NYC, by using the 311 complaint data together with social media, road network data, and Points of Interests (POIs). Methodology: We model the noise situation of NYC with a three dimension tensor, where the three dimensions stand for regions, noise categories, and time slots, respectively. Supplementing the missing entries of the tensor through a context-aware tensor decomposition approach, we recover the noise situation throughout NYC. The information can inform people and officials’ decision making. Yu Zheng, Tong Liu, Yilun Wang, Yanchi Liu, Yanmin Zhu, Eric Chang. Diagnosing New York City’s Noises with Ubiquitous Data. In Proceedings of the 16th ACM International Joint Conference on Pervasive and Ubiquitous Computing (UbiComp 2014). Tong Liu, Yu Zheng, Lubin Liu, Yanchi Liu, Yanmin Zhu. Methods for Sensing Urban Noises. MSR-TR-2014-66, May 2014. Yilun Wang, Yu Zheng, Tong Liu. A Noise Map of New York City. In Proc. of Ubicomp 2014, Demo. Urban water quality is of great importance to our daily lives. Prediction of urban water quality help control water pollution and protect human health. In this work, we forecast the water quality of a station over the next few hours, using a multitask multi-view learning method to fuse multiple datasets from different domains. In particular, our learning model comprises two alignments. The first alignment is the spaio-temporal view alignment, which combines local spatial and temporal information of each station. The second alignment is the prediction alignment among stations, which captures their spatial correlations and performs co-predictions by incorporating these correlations. This approach has been evaluated based on the data of Shenzhen city in China. Abstract: We present a large-scale taxi ridesharing service, which efficiently serves real-time requests sent by taxi users and generates ridesharing schedules that reduce the total travel distance significantly. We first propose a taxi searching algorithm using a spatio-temporal index to quickly retrieve candidate taxies that could satisfy a user query. A schedule allocation algorithm is then proposed to check each candidate taxi so as to insert the user’s trip into the schedule of the taxi. Our service can serve 40% additional taxi users while saving 15% travel distance over no ridesharing on average. Shuo Ma, Yu Zheng, Ouri Wolfson. T-Share: A Large-Scale Dynamic Taxi Ridesharing Service. IEEE International Conference on Data Engineering (ICDE 2013) Best Paper Runner-up Award. Abstract: We propose a citywide and real-time model for estimating the travel time of any path (represented as a sequence of connected road segments) in a city instantly, based on the GPS trajectories of vehicles received in current time slots and over a period of history as well as map data sources. The problem has not been well solved yet given the following three challenges. The first is the data sparsity problem, i.e., many road segments may not be traveled by any GPS-equipped vehicles in present time slot. Second, for the fragment of a path with trajectories, they are multiple ways of using (or combining) the trajectories to estimate the corresponding travel time. Finding an optimal combination is a challenging problem. Third, we need to instantly answer users’ queries which may occur in any part of a given city. This calls for an efficient, scalable and effective solution that can enable a citywide and real-time travel time estimation. Goal: In this research, we aim to mine the time-dependent and practically quickest driving route for end users using GPS-equipped taxicabs traveling in a city. Insight: The time that a driver traverses a route depends on three aspects: 1) The physical feature of a route, such as distance, the number of traffic lights and direction turns; 2) The time-dependent traffic flow on the route; 3) A user’s drive behavior. Thus, a good routing service should consider these three aspects (routes, traffic and drivers), which are far beyond the scope of the shortest path computing. GPS-equipped taxis can be regarded as mobile sensors probing traffic flows on road surfaces, and taxi drivers are usually experienced in finding the fastest (quickest) route to a destination based on their knowledge. Consequently, the trajectories of taxicabs already have the knowledge of experienced drivers, physical routes and traffic conditions. In the beginning of this work, we mine smart driving directions from the historical GPS trajectories of a large number of taxis, and provide a user with the practically fastest route to a given destination at a given departure time. We build our system based on a trajectory dataset generated by over 33,000 taxis in a period of 3 months. According to extensive synthetic experiments and in-the-field evaluations, this system saves 5 minutes per 30-minute trip. See details in the following publications. Jing Yuan, Yu Zheng, et al. T-Drive: Driving Directions Based on Taxi Trajectories. In ACM SIGSPATIAL GIS 2010, The Best Paper Runner-Up Award. Jing Yuan, Yu Zheng, et al, T-Drive: Enhancing Driving Directions with Taxi Drivers’ Intelligence. Transactions on Knowledge and Data Engineering (TKDE). Further Research: Later, we expanded this research by considering the drive behavior and traffic prediction as well as other factors affecting driving, such as weather conditions. Specifically, we proposed a model incorporating day of the week, time of day, weather conditions, and individual driving strategies (both of the taxi drivers and of the end user for whom the route is being computed). Using this model, our system predicts the traffic conditions of a future time (when the computed route is actually driven) and performs a self-adaptive driving direction service for a particular user. This service gradually learns a user’s driving behavior from the user’s GPS logs and customizes the fastest route for the user. Refer to the following publication for details. Jing Yuan, Yu Zheng, et al. Driving with Knowledge from the Physical World. 17th SIGKDD conference on Knowledge Discovery and Data Mining (KDD 2011). “A driving route made just for you“, MIT Technology Review, 2011.8.30. Abstract: We present a recommender for taxi drivers and people expecting to take a taxi, using the knowledge of 1) passengers’ mobility patterns and 2) taxi drivers’ pick-up behaviors learned from the GPS trajectories of taxicabs. First, this recommender provides taxi drivers with some locations (and the routes to these locations), towards which they are more likely to pick up passengers quickly (during the routes or at the parking places) and maximize the profit. Second, it recommends people with some locations (within a walking distance) where they can easily find vacant taxis. In our method, we propose a parking place detection algorithm and learn the above knowledge (represented by probabilities) from trajectories. Then, we feed the knowledge into a probabilistic model which estimates the profit of a parking place for a particular driver based on where and when the driver requests for the recommendation. We validate our recommender using trajectories generated by 12,000 taxis in 110 days. Jing Yuan, Yu Zheng, Liuhang Zhang, Xing Xie. Where to Find My Next Passenger? , 13th ACM International Conference on Ubiquitous Computing (UbiComp 2011). Nicholas Jing Yuan, Yu Zheng, Liuhang Zhang, Xing Xie. T-Finder: A Recommender System for Finding Passengers and Vacant Taxis. accepted by IEEE Transactions on Knowledge and Data Engineering (TKDE). Abstract: Bike-sharing systems are widely deployed in many major cities, providing a conven­ient tra­n­s­­por­tation mode for citizens’ comm­utes. As the rents/returns of bikes at different stations in different periods are unbalanced, the bikes in a system need to be rebalanced frequently. In this paper, we propose a hierarchical prediction model to predict the number of bikes that will be rent from/returned to each station cluster in a future period so that reallocation can be executed in advance. Methodology: We first propose a bipartite clustering algori­thm to cluster bike stations into groups, formula­ting a two-level hier­archy of stations. The total number of bikes that will be rent in a city is predicted by a Gradient Boosting Regression Tree (GBRT). Then a multi-similarity-based infer­en­ce model is propo­sed to predi­ct the rent propor­tion across clusters and the inter-cluster transition, based on which the number of bikes rent from/ returned to each cluster can be easily inferred. Goal: We propose a framework (titled DRoF) that Discovers Regions of different Functions, such as educational areas and business districts, in a city using both human mobility among regions and points of interests (POIs) located in a region. The results generated by our framework can benefit a variety of applications, including urban planning, location choosing for a business, and social recommendations. Insight: We segment a city into disjointed regions according to major roads, such as highways and urban express ways. We infer the functions of each region using a topic-based inference model, which regards a region as a document, a function as a topic, categories of POIs (e.g., restaurants and shopping malls) as metadata (like authors, affiliations, and key words), and human mobility patterns (when people reach/leave a region and where people come from and leave for) as words. As a result, a region is represented by a distribution of functions, and a function is featured by a distribution of mobility patterns. Jing Yuan, Yu Zheng, Xing Xie. Discovering regions of different functions in a city using human mobility and POIs. 18th SIGKDD conference on Knowledge Discovery and Data Mining (KDD 2012). Nicholas Jing Yuan, Yu Zheng, Xing Xie, Yingzi Wang, Kai Zheng, Hui Xiong. Discovering Urban Functional Zones Using Latent Activity Trajectories, IEEE Transactions on Knowledge and Data Engineering (TKDE), 2016. 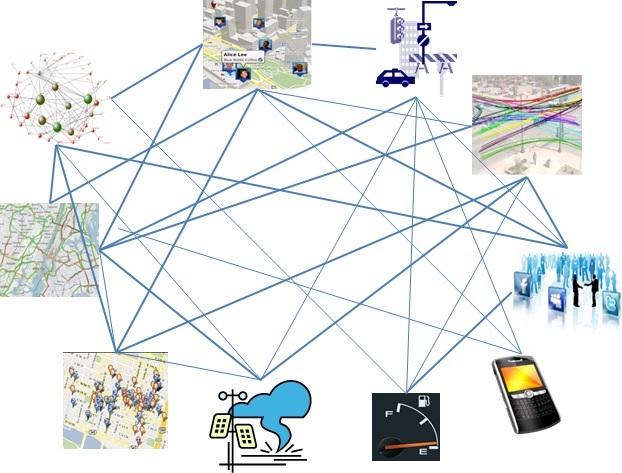 Abstract: Urban computing for city planning is one of the most significant applications in Ubiquitous computing. In this paper we detect flawed urban planning using the GPS trajectories of taxicabs traveling in urban areas. The detected results consist of 1) pairs of regions with salient traffic problems and 2) the linking structure as well as correlation among them. These results can evaluate the effectiveness of the carried out planning, such as a newly built road and subway lines in a city, and remind city planners of a problem that has not been recognized when they conceive future plans. We conduct our method using the trajectories generated by 30,000 taxis from March to May in 2009 and 2010 in Beijing, and evaluate our results with the real urban planning of Beijing. Yu Zheng, Yanchi Liu, Jing Yuan, Xing Xie, Urban Computing with Taxicabs, 13th ACM International Conference on Ubiquitous Computing (UbiComp 2011), Beijing, China, Sep. 2011. The best paper nominee award. A technical report describing the map segmentation and trajectory projection details. 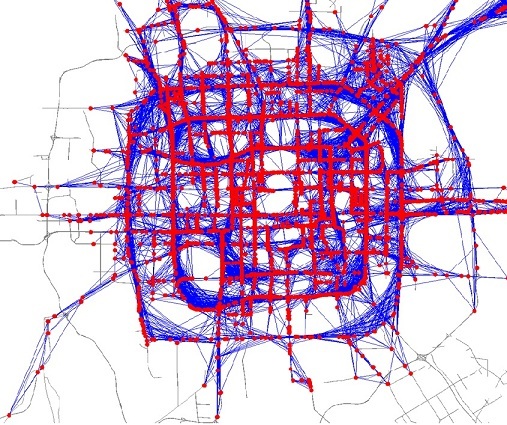 “GPS Data on Beijing Cabs Reveals the Cause of the Traffic Jams“. MIT Technology Review, 2011.9.27. Featured on the first page. Abstract: An urban black hole is a subgraph (or a region) that has the overall inflow greater than the overall outflow by a threshold, while a volcano is a subgraph with the overall outflow greater than the overall inflow by a threshold. The online detection of black holes/volcanos can timely reflect anomalous events, such as disasters, catastrophic accidents, and therefore help keep public safety. The patterns of black holes/volcanos and the relations between them reveal human mobility patterns in a city, thus help formulate a better city planning or improve a system’s operation efficiency. Cycling as a green transportation mode has been promoted by many governments all over the world. As a result, constructing effective bike lanes has become a crucial task for governments promoting the cycling life style, as well-planned bike paths can reduce traffic congestion and decrease safety risks for both cyclists and motor vehicle drivers. Unfortunately, existing trajectory mining approaches for bike lane planning do not consider key realistic government constraints: 1) budget limitations, 2) construction convenience, and 3) bike lane utilization. In this project, we propose a data-driven approach to develop bike lane construction plans based on large-scale real world bike trajectory data. We enforce these constraints to formulate our problem and introduce a flexible objective function to tune the benefit between coverage of the number of users and the length of their trajectories. We prove the NP-hardness of the problem and propose greedy-based heuristics to address it. Finally, we deploy our system on Microsoft Azure, providing extensive experiments and case studies to demonstrate the effectiveness of our approach. Jie Bao, Tianfu He, Sijie Ruan, Yanhua Li, Yu Zheng. Planning bike lanes based on Sharing-bike’s trajectories. in Proceedings of the 23th SIGKDD conference on Knowledge Discovery and Data Mining (KDD 2017). Goal: We instantly infers the gas consumption and pollution emission of vehicles traveling on a city’s road network in a current time slot, using GPS trajectories from a sample of vehicles (e.g., taxicabs). The knowledge can be used to suggest cost-efficient driving routes as well as identifying road segments where gas has been wasted significantly. Methodology: We propose a Travel Speed Estimation (TSE) model based on a context-aware matrix factorization approach. TSE leverages features learned from other data sources, e.g., map data and historical trajectories, to deal with the data sparsity problem. We then propose a Traffic Volume Inference (TVI) model to infer the number of vehicles passing each road segment per minute. TVI is an unsupervised Bayesian Network that incorporates multiple factors, such as travel speed, weather conditions and geographical features of a road. Given the travel speed and traffic volume of a road segment, gas consumption and emissions are calculated based on existing environmental theories. Refer to publication  for details. We propose a step toward real-time sensing of refueling behavior and citywide petrol consumption. We use reported trajectories from a fleet of GPS-equipped taxicabs to detect gas station visits, measure the time spent, and estimate overall demand. For times and stations with sparse data, we use collaborative filtering to estimate conditions. Our system provides real-time estimates of gas stations’ wait times, from which recommendations could be made, an indicator of overall gas usage, from which macro-scale economic decisions could be made, and a geographic view of the efficiency of gas station placement. refer to publication  and  for details. Jingbo Shang*, Yu Zheng, Wenzhu Tong, Eric Chang. Inferring Gas Consumption and Pollution Emission of Vehicles throughout a City. In the Proceeding of the 20th SIGKDD conference on Knowledge Discovery and Data Mining (KDD 2014). Fuzheng Zhang*, Nicholas Jing Yuan, David Wilkie, Yu Zheng, Xing Xie. Sensing the Pulse of Urban Refueling Behavior: A Perspective from Taxi Mobility. ACM Transaction on Intelligent Systems and Technology (ACM TIST). 2015. Media coverage: featured by United Nations. Abstract: Predicting the movement of crowds in a city is strategically important for traffic management, risk assessment, and public safety. In this project, we propose predicting two types of flows of crowds in every region of a city based on big data, including human mobility data, weather conditions, and road network data. To develop a practical solution for citywide traffic prediction, we first partition the map of a city into regions using both its road network and historical records of human mobility. Our problem is different than the predictions of each individual’s movements and each road segment’s traffic conditions, which are computationally costly and not necessary from the perspective of public safety on a citywide scale. To model the multiple complex factors affecting crowd flows, we decompose flows into three components: seasonal (periodic patterns), trend (changes in periodic patterns), and residual flows (instantaneous changes). The seasonal and trend models are built as intrinsic Gaussian Markov random fields which can cope with noisy and missing data, whereas a residual model exploits the spatio-temporal dependence among different flows and regions, as well as the effect of weather. Abstract: Forecasting the flow of crowds is of great importance to traffic management and public safety, yet a very challenging task affected by many complex factors, such as inter-region traffic, events and weather. In this paper, we propose a deep-learning-based approach, called ST-ResNet, to collectively forecast the in-flow and out-flow of crowds in each and every region through a city. We design the end-to-end structure of ST-ResNet based on unique properties of spatio-temporal data. More specifically, we employ the framework of the residual neural networks to model the temporal smoothness, period, and trend properties of crowd traffic, respectively. For each property, we design a branch of residual convolutional blocks, each of which models the spatial properties of crowd traffic. ST-ResNet learns to dynamically aggregate the output of the three residual neural networks based on data, assigning different weights to different branches and regions. The aggregation is further combined with external factors, such as weather and day of week, to predict the final traffic of crowds in each and every region. We evaluate ST-ResNet based on two types of crowd flows in Beijing and NYC, finding its performance outperforming the state-of-the-art. Abstract: The collective anom­aly denotes a collection of nearby locations that are anomalous during a few consecutive time intervals in terms of phenomena collectively witnessed by multiple datasets. The collective anoma­lies suggest there are underlying problems that may not be identified based on a single data source or in a single location. It also assoc­iates individual locations and time intervals, formulating a panora­mic view of an event. To detect a collective anomaly is very challe­n­ging, however, as different data­sets have diff­erent densities, distributions, and scales. Additional­ly, to find the spatio-temporal scope of a collective anomaly is time consu­ming as there are many ways to combine regions and time slots. Detecting Traffic Anomalies: We detect anomalies in a city according to the taxi trajectories. The anomaly could be caused by unexpected or sudden accidents, such as traffic control, protests, concerts, parades, celebrations, and large-scale sale promotion. In many cases, the anomaly occurs before the corresponding accident actually happens. If detecting the unusual mobility pattern of people in this region in advance, we can solve the problem early and avoid the happening of the tragedy. [a] Wei Liu, Yu Zheng, Sanjay Chawla, Jing Yuan and Xing Xie. Discovering Spatio-Temporal Causal Interactions in Traffic Data Streams. In KDD 2011. Diagnose and Describe Traffic Anomalies: In publication , we identify the source traffic flow that results in an anomaly. In publication [d], we address the problem of detecting and describing traffic anomalies using crowd sensing with two forms of data, human mobility and social media. Sanjay Chawla, Yu Zheng, and Jiafeng Hu. Inferring the root cause in road traffic anomalies, IEEE International Conference on Data Mining (ICDM 2012). Abstract: Ranking residential real estate based on a diversity of big data around a real estate: 1) geographical data, such as road network and points of interests (POI), 2) human mobility data, like public commuting data and taxi traces, and 3) people’s comments and reviews on these real estates and their surrounding POIs in online services. These datasets reveal the popularity and quality of the location where a real estate is located. Yanjie Fu, Hui Xiong, Yong Ge, Zijun Yao, Yu Zheng. Exploiting Geographic Dependencies for Real Estate Appraisal: A Mutual Perspective of Ranking and Clustering. In the Proceeding of the 20th SIGKDD conference on Knowledge Discovery and Data Mining (KDD 2014). Yanjie Fu, Yong Ge, Yu Zheng, Zijun Yao, Yanchi Liu, Hui Xiong, Nicholas Jing Yuan. Sparse Real Estate Ranking with Online User Reviews and Offline Moving Behaviors. IEEE International Conference on Data Mining (ICDM 2014). Abstract: Due to the large number of requirements for city express services in recent years, the current city express system is found to be unsatisfactory for both the service providers and customers. In this paper, we are the first to systematically study the large-scale dynamic city express problem. We aim to increase both the effectiveness and the efficiency of the scheduling algorithm. The challenges of the problem stem from the highly dynamic environment, the NP-completeness with respect to the number of requests, and real-time demands for the scheduling result. our solution can save 37.5% manpower to achieve 80% satisfaction ratio compared to the basic solution. Abstract: The problem of formulating solutions immediately and comparing them rapidly for billboard placements has plagued advertising planners for a long time, owing to the lack of efficient tools for in-depth analyses to make informed decisions. In this study, we attempt to employ visual analytics that combines the state-of-the-art mining and visualization techniques to tackle this problem using large-scale GPS trajectory data. In particular, we present SmartAdP, an interactive visual analytics system that deals with the two major challenges including finding good solutions in a huge solution space and comparing the solutions in a visual and intuitive manner. An interactive framework that integrates a novel visualization-driven data mining model enables advertising planners to effectively and efficiently formulate good candidate solutions. Dongyu Liu, Di Weng, Yuhong Li, Yingcai Wu, Jie Bao, Yu Zheng, Huaming Qu, “SmartAdP: Visual Analytics of Large-scale Taxi Trajectories for Selecting Billboard Locations”, in The IEEE Conference on Visual Analytics Science and Technology (IEEE VAST 2016). T-Drive Taxi Trajectroies: This is a sample of T-Drive taxi trajectory dataset which was generated by over 10,000 taxis in a period of one week in Beijing. GeoLife Trajectory Dataset: This is a GPS trajectory dataset collected in (Microsoft Research Asia) GeoLife project by 167 users in a period of over two years (from April 2007 to Dec. 2010). This trajectory dataset can be used for many research theme, such as mobility pattern mining, user activity recognition, location-based social networks, location privacy, and location recommendation. Taxi request simulator: This simulator can generate people’s request for taxicabs on different road segments, using the knowledge mined from a large-scale real taxi trajectories. Each query consists of an origin, destination, and a timestamp. Check-in data from Foursquare: Each check-in includes a venue ID, the category of the venue, a timestamp, and a user ID. Air quality data of Beijing and Shanghai: The data set is comprised of one-year (2013-2-8 to 2014-2-8) air quality data from air quality monitoring stations in Beijing and Shanghai. Traffic and geographical features of each road segments: The package is comprised of six parts of data that were extracted from the GPS trajectories of taxicabs, road networks, POIs of Beijing, and video clips recording real traffic on roads. Noise complaint data and geographical data of NYC: This package is comprised of three parts of data. 1) tensors representing the 311 complaints on urban noise; 2) geographical feature of each region in NYC; 3) Real noise levels of 36 locations in NYC. Please cite the following two papers when using the dataset. Air quality data, meteorological data and weather forecasts of 43 cities in China. The dataset was used for air quality forecast and real-time inference. It also can be used for test cross-domain data fusion methods. Bike Sharing data coupled with weather conditions. The dataset contains bike usage (denoted by the number of check-outs and check-ins) at each bike sharing station in NYC and Chicago. The weather condition data during the period, in which the bike sharing data is collected, is also shared. Three datasets for detecting collective anomalies: This dataset is comprised of five parts of data, named Taxi Trip Data, Bike sharing data, 311 data, POIs and road network data of NYC. Keynote at UrbComp2017: Urban Computing: Enabling Intelligent Cities with AI and Big Data (50 minutes), 2017.8, video. 2016.2.1：a slide deck for a 90-minute overview on Urban Computing. 1-hour MOOC on Urban Computing.